PRESS RELEASE: BOOM! Studios, DeVito Artworks LLC, and Twentieth Century Fox Consumer Products are excited to announce KONG ON THE PLANET OF THE APES, a comic book series bringing together two of entertainment’s biggest icons for the first time ever! Writer Ryan Ferrier (Mighty Morphin Power Rangers, Kennel Block Blues) and artist Carlos Magno (Planet of the Apes, Kong of Skull Island) team up for the six-issue series that promises to deliver an epic story starring the best-known primates in pop culture. 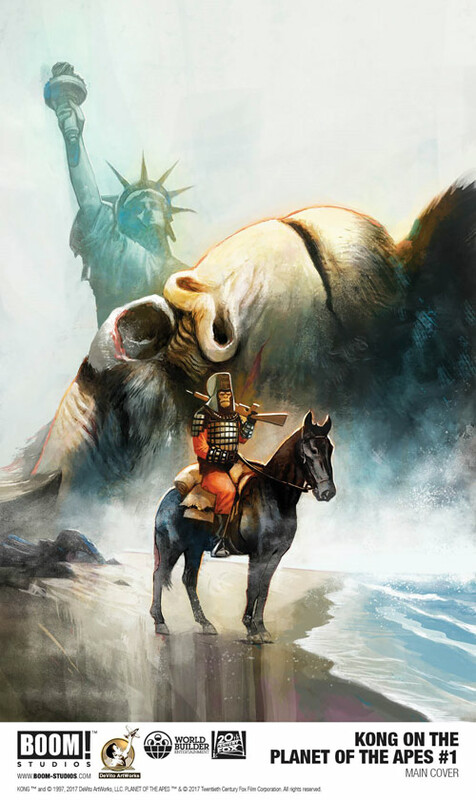 Print copies of Kong on the Planet of the Apes #1 will be available for sale in November at local comic book shops.